The low tides, especially those below mean lower low water (0.0′), afford an opportunity to observe Pisaster ochraceus, wherever rocky outcrops jut from the sand. On the exposed coast, P. ochraceus need to stay attached to rocks. They are slow-movers but they get around, maneuvering up and down on their rock as the tides rise and fall. I get the feeling, all things being equal, they are most at home submerged. But all things aren’t equal. On the high side, their frequent prey, mussels and barnacles, tend to live above 0.0′ which means lots of exposure, and on the low side, sometimes they just run out of rocky real estate. The dusting of sand you see at the bottom of the photo above foreshadows the meeting of rock and beach just below the lower border of the photo. These individuals are bunched up at the lower edge of their rock, which meets the sand at about about 1.3′ below mean low water. The photo below, another low tide scene, reveals the the big picture, from the mussel bed to sand-meets-rock. This high rock is inhabited by Piaster’s favorite prey- mussels, barnacles and gastropods. The P. ochraceus association with mussels, barnacles and gastropods is well known and well studied. P. ochraceus is an effective predator that can shape the distributional patterns of it’s prey and other species. Species with this kind of profound effect have been called keystone species. If you want to learn about this concept a good place to start is Paine 1966. A good review and experimental test of Paine’s ideas almost 30 years later is given by Menge et al., 1994. The star of the show is P. ochraceus, so you might want to check it out. Or, if you don’t want to work that hard, check out this brief summary of the keystone species idea. Pisaster ochraceus go by a variety of common names. Preparing for this post, the first three references I picked up called them purple star, ochre star and common seastar, respectively. That amount of variation, even in common names, seemed a little unusual so, seeking resolution, I consulted a fourth guide, Lamb and Hanby’s Marine Life of the Pacific Northwest (2005) where I found this list of common names: purple sea star, ochre sea star, ochre seastar, purple starfish, ochre starfish, Pacific sea star, common seastar, common sea star, common purple star, warty sea star and common starfish. What do you call P. ochraceus? The scientific name P. ochraceus suggests an ochre body color but most sea stars I encounter on the outer shores are purple. The photo above shows two color phases, purple and ochre-ish. Whenever I see two or more color forms I wonder if there is a genetic versus environmental basis and if there are tradeoffs that allow both forms to exist. This particular polymorphism has been studied and if you want to learn more about it check out Harley et al., 2006. In the opening photo for this post the purple to ochre ratio is about 5:1. Next time you are out at low tide try counting the color phases to determine the ratio for your area. If you find P. ochraceus on a sandy beach as I did early in the morning on June 15, 2012 (above), something is wrong. A gull or human has plucked it off a rock, or some other accident has befallen it. On the sandy beaches, beachcombers almost never see P. ochraceus unless there are some rocks about but they will almost always encounter evidence of the sand dollar. This is the test or shell of the eccentric sand dollar, Dendraster excentricus. Sand dollars, like sea stars, are echinoderms, a group that also includes brittle stars, sea urchins and sea cucumbers. Eccentric sand dollars are common on sandy seabeds in the subtidal zone and their tests frequently wash up on sandy beaches. Live D. excentricus are dark colored and covered with tiny spines. Live sand dollars are rarely encountered on the exposed coast; it takes a good low tide. They will occasionally be encountered in the lowest reaches of the infralittoral fringe and the best beds, no question, are subtidal, often in the bays. If you love echinoderms and think perhaps radial symmetry is for you, check out Christopher Mah’s The Echinoblog. Harley, C. D. G., Pankey, M. S., Wares, J. P., Grosberg, R. K., and M. J. Wonham. 2006. Color polymorphism and genetic structure in the sea star Pisaster ochraceus. Biol. Bull. 211: 248-262. Menge, B. A., E. L. Berlow, C. A. Blanchette, S. A. Navarrete, and S. B. Yamada. 1994. 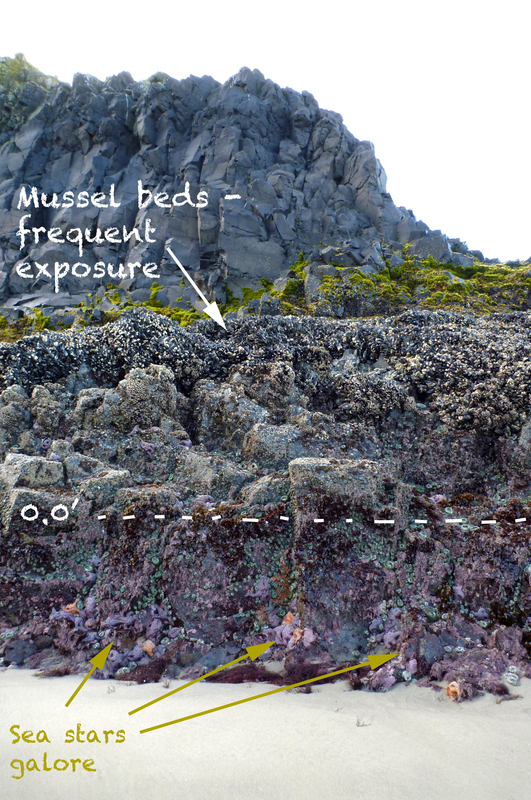 The keystone species concept: variation in interaction strength in a rocky intertidal habitat. Ecological Monographs 64 (3): 249-286. Paine, R. T. 1966. Food web complexity and species diversity. The American Naturalist, 100 (910): 65-75.